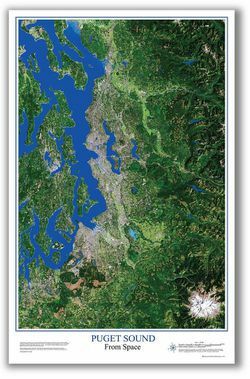 The Puget Sound Satellite photo is made from the processing of digital data from the Handsat 5 Remote Sensing Satellite, this scale of image shows details as small as 90 feet on the ground. One can make out the details of highways, rivers and lakes, urbanized areas, land clearings, and larger building structures. A supplemental sheet is included which identifies some of the prominent geographical highlights.